MADRID - Spain's government said Friday it could lower its forecast for next year's economic growth if the crisis over Catalonia's independence drive persists. 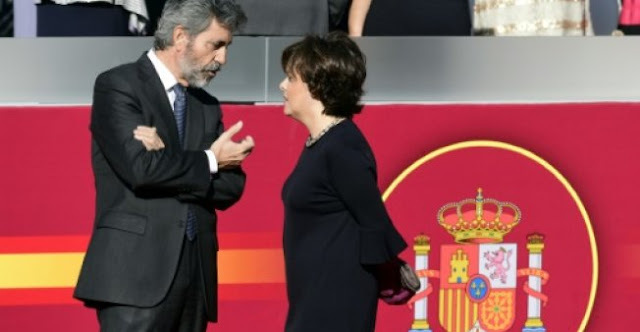 "If there is no quick solution, we see ourselves having to lower economic forecasts for 2018," deputy prime minister Soraya Saenz de Santamaria told reporters in Madrid. Spain in July said it expected growth of 2.6 percent next year. The eurozone's fourth largest economy is undergoing its most serious political crisis in a generation after Catalonia's separatist leader said he had accepted a mandate from a banned secession referendum for the region to "become an independent state". Although Carles Puigdemont suspended the declaration, calling for more time for talks with Madrid, the central government has given him until October 19 to drop his push for independence. The uncertainty is harming business confidence in Catalonia, which accounts for one fifth of Spain's GDP, and there are fears a prolonged crisis could damage the national economy. Dozens of firms have already moved their legal headquarters from Catalonia and ratings agencies Standard and Poor's and Fitch have said they are considering downgrading the region's credit score. "Events in Catalonia imperil the economic recovery. Investments have fallen 10 percent in Catalonia even as they've increased 3 percent in the rest of Spain," Santamaria said. She said that tourist bookings in Barcelona had plunged between 20-30 percent. "When uncertainty takes hold, the price is always paid by the Catalan citizens," she said calling on the separatists to return to "normality." The Spanish central bank's current growth predictions are for 2.5 percent in 2018 and 2.2 percent the following year. Spain's government said Friday it could lower its forecast for next year's economic growth if the crisis over Catalonia's independence drive persists.